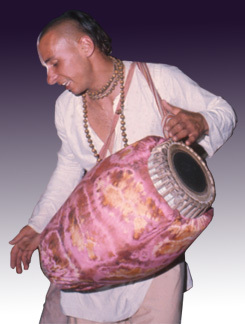 "He danced through the streets chanting like a transcendental madman, personifying Sri Caitanya's sankirtan movement. Bringing form to bhakti, he enthusiastically helped Srila Prabhupada bring Krishna Consciousness into this world. "Thirty years ago, Vishnujana Swami mysteriously disappeared from our lives. Now, the transcendental radiance of his blissful personality again shines in this world, making its way into our hearts..."